It started early – much earlier than I would have liked. I awoke at about 4:30 AM on Christmas Day but unfortunately it was not the sound of sleigh bells that had roused me. Outside there was the sound of gentle but persistent rain. It also felt considerably milder that the temperatures of late. So, no more sleep for me it seemed. All I was going to do from that point on was fret about the goose not being cold enough and having to fire up my precious, hand-imported-by-Keith-and-Marlene, Kingsford charcoal in the rain. I turned the light on and read my book but my mind was only half on it, the remaining half being outside messing with a wet Weber grill. All I really succeeded in doing was disturbing Carol, of course. Eventually the hands of the clock clawed their way around to time for relief in the form of tea. Carol went and put the stockings left by Santa for Keith and Marlene outside their door and we set about our own stockings. What big kids, but then, that’s what Christmas is for, mostly, isn’t it? Following the luxury of tea and stockings in bed, we arose to get our fix of coffee with a splash of rum, an addition reserved for Christmas festivities, and to heat some of Carol’s absolutely excellent home-made sausage rolls. These would be used to nibble, along with a few glasses of Cava while we all gathered around the tree in the conservatory to hit the main presents. There were a lot of new mugs which seemed to be something of a theme this year. Both couples had also made gifts to each other of framed photographs from our trip to Virginia of November, 2006. Great minds, apparently, really do think alike. It’s not unusual for the weather to turn from being pleasantly clear and cool to being muggy and damp for Christmas Day. It was the Victorians, not Bing Crosby, that invented the amazingly rare white Christmas. It was much more to do with Charles Dickens and snowy-scened Christmas cards. At 11:30 AM in the real world, however, the rain was continuing but it was time to bite the bullet and start preparing the bird. I managed to borrow a large sunshade, which doubled as a large umbrella, from neighbour Paul. It wasn’t me, I was concerned about but rather the charcoal. 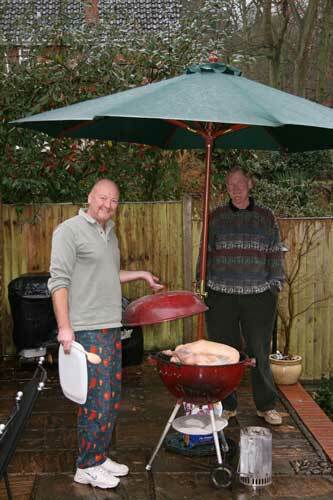 No problem though, good ol’ Kingsford fired up under the protection of its purloined parasol and goosey loosey was soon in for what I expected to be about a three hour roasting. Scoring the skin and using a Weber is a great way to cook goose (and duck, for that matter) ‘cos most of the abundant grease runs out. You need a large drip pan, though. Meanwhile, Carol and Marlene set about the vegetables. The brussel-sprouts-on-a-stalk provided a source of fascination, K&M never before having seen them on the plant. Parsnips and roast potatoes a la graisse d’oie (goose fat) would complete the main course, while a Christmas pudding, together with brandy butter and/or cream and/or custard would fill in any carelessly left gaps. After the expected three hours of tending the BBQ by occasionally feeding in a few extra briquettes of charcoal, my jealously guarded 1993 Cabernet Sauvignon from Caymus Vineyards was a perfect (and, apparently, now expensive) accompaniment to a splendid goose with suitably rich, crispy skin. The hapless bird had not died in vain. Any room room left for a little cheese and port, anyone? Well, perhaps later. 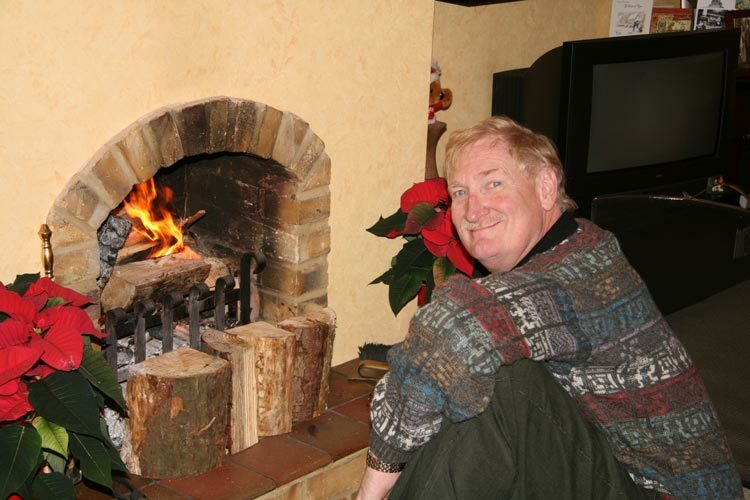 Keith struggled gamely to get a fire going so that we might “roast chestnuts on an open fire” but, although he succeeded in getting flames going, our logs really weren’t seasoned sufficiently to create the required red embers. Carol loaded up the chestnut roaster and gave it a go but the results were not great; there just wasn’t enough heat, even though we, ourselves, seemed to feel overheated. Maybe the logs will be dry enough for next year. All in all, a successful day despite the chestnuts. We hope everyone’s Christmas Day was as good as ours.